1. Cut 2 long strips of folded greaseproof paper and grease an 18cm loose-bottomed tin with a small amount of butter. Position the 2 strips so they cross over at the bottom of the tin and come all the way up and overlap the sides. This will make the cheesecake easier to remove from the tin. 2. Using a food processor, blend the biscuits into fine crumbs. Melt the butter in a small saucepan or in the microwave and mix with the biscuit crumbs. Press the mixture into the tin using a spatula, then chill in the fridge for 15-20 minutes or until firm. 3. Beat together the soft cheese, double cream, lemon zest, juice and caster sugar in a large bowl until smooth and beginning to thicken. Pour the mixture onto the chilled base and smooth the top with a spatula, before returning to the fridge for at least 4 hours or until set. 4. To make the topping, halve the passion fruit and remove the pulp. Put the cornflour into a small saucepan and add 50ml of water. Stir to make a paste, then add the passion fruit pulp, sugar and lemon juice. Warm over a low heat, stirring all the time, until the mixture thickens and becomes glossy. Remove from the heat, cool, then chill until ready to use. 5. Gently remove the cheesecake from the tin and place onto a serving plate. 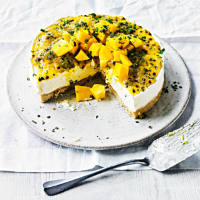 Stir the chilli flakes (if using) and half the chopped mint into the passion fruit topping, then spread over the top of the cheesecake. Pile the cubed mango in the centre, then finish with the remaining mint. Serve immediately. This cheesecake is best eaten the day it is made, but will keep for 2-3 days in the fridge before topping with fruit.